HONOLULU – The Hawaii Department of Transportation (HDOT) advises passengers who plan to park in one of the parking garages at the Daniel K. Inouye International Airport (HNL) to be aware of recent signage improvement projects designed to help people find their parking stall. Each of the parking garages has been assigned its own distinct color throughout the structure. The Terminal 1 (formerly Interisland Terminal) garage is now green, the International garage is blue and the Terminal 2 (formerly Overseas Terminal) garage is red. The colors also match the new signage located over the roadways. 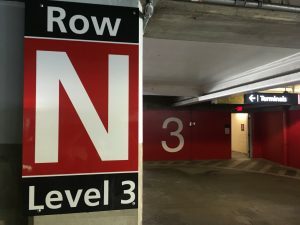 New signage has also been added throughout the garages specifically identifying each row, level and color (see photos). People are encouraged to take a picture of the sign in their row after they park as a reference to help remember their parking location. Smart phone technology is also capable of remembering parking location. HDOT is pleased to have finished the installation of 4,260 solar panels on the 7th floor of the Terminal 1 parking garage at HNL. In completing the project on time and on budget more than 340 shaded parking stalls have been reopened for public use in time for the Thanksgiving travel period. For more information regarding the environmentally friendly improvement please click here. The Thanksgiving holiday is one of the busiest times at Hawaii’s airports and travelers are alerted to the limited parking at the five main airports across the state. Travelers are encouraged to get dropped off at the airport or schedule another method of transportation. If travelers plan to park at the airport they are advised to arrive early and allow for additional walking time to the ticket lobbies. The maximum parking rate for a 24-hour period at HNL is $18. The maximum parking rate for a 24-hour parking at neighbor island airports is $15. Drivers should place their parking ticket stub in a safe place that is not visible from the outside of the vehicle. Do not leave it on the car’s dashboard. 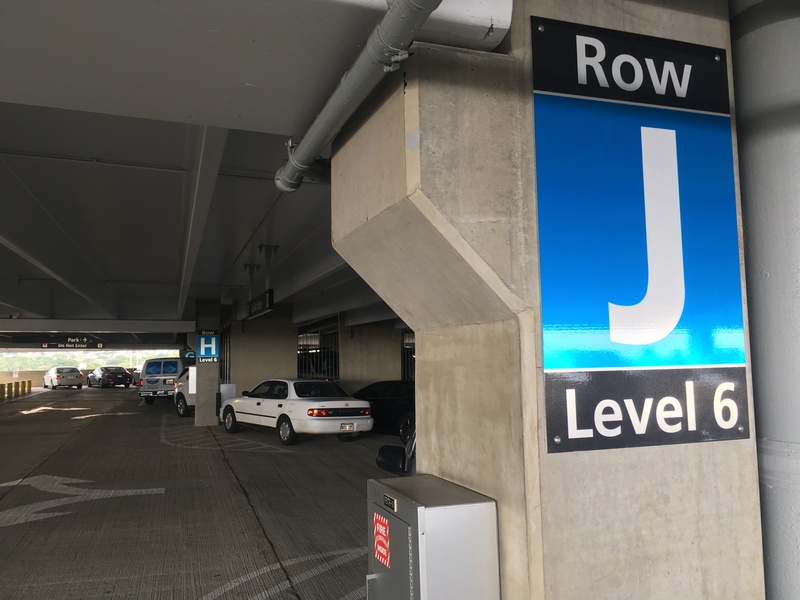 The sign replacement project at HNL will replace approximately 3,100 indoor and outdoor signs including airport signage along the roadways, within HNL terminals, and parking structure signs. 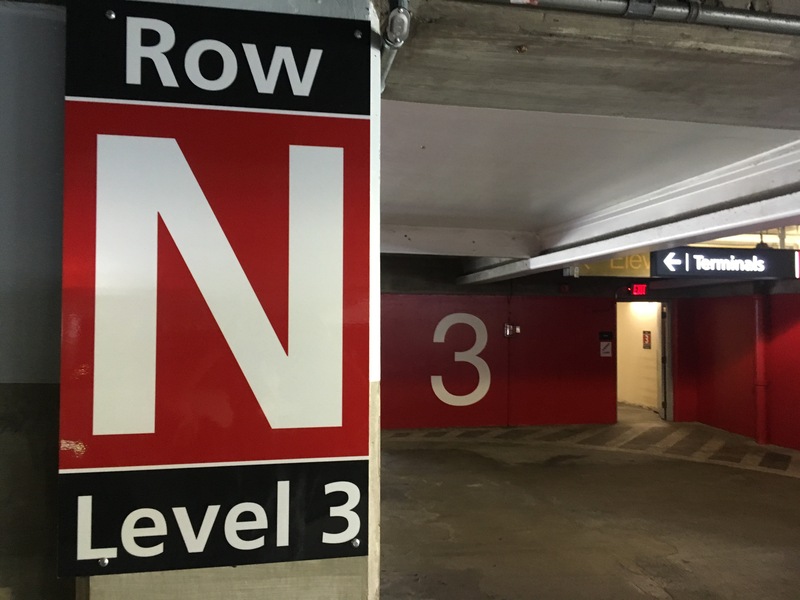 The work to replace the signs involves the removal, retrofit or replacement of overhead roadway sign structures; installation of ground mounted roadway signs and supports; and, installation of signs and supports in the parking structures and terminals. Electrical work, traffic control, ceiling patching, and other associated improvements are also included. The overall signage improvement project is anticipated to be finished in Summer 2019. Please courtesy “HDOT” or “Hawaii Department of Transportation” if the photos are used. 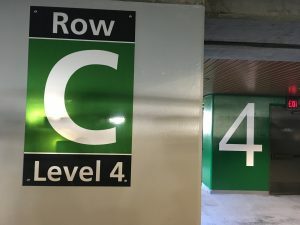 The Terminal 1 (formerly named Interisland Terminal) parking garage is now painted green. The International parking garage’s color is blue. Terminal 2 (formerly named Overseas Terminal) is painted red.